So, this verse came up in my Bible reading today. And, as I often do when something moves me, I #GoogleIt. (I know…. you were expecting something deep like meditate or prophesy. But, no. You got Google 😉). My Google search led me to the picture of the lovely crown you see here. But this picture became more meaningful because as I was Googling, I was listening to a prayer call by incredible inspirational teacher and Amazing Church #WorshipPastor, Barbara Calloway. She was talking about the #HolySpirit and specifically the importance of #unity. Here’s something she said: “Break out of your comfort zone and decide you are going to be unified together”. As words and thoughts of unity hung in the early morning air, I continued to stare at the picture on my screen. As I looked at the beautiful crown, I realized that – although a pile of diamonds would be a site to behold – this artistic work of jewelry is so amazing and even more valuable because the individual stones have been crafted together into one beautiful masterpiece. In the same way that the uncrafted pile of diamonds was easy and effort-free, the introverted and conflict-avoiding version of me finds it easier to stay a “lone diamond” capturing a little glimmer of my Father’s light all on my own. But if I press through past the awkward seasons and difficult conversations that are eventually and inevitably part of every healthy relationship, how much more beauty, value, and #GodLight will be reflected in the unified whole of so many different and precious individuals! I think we’ll find it worth the effort. 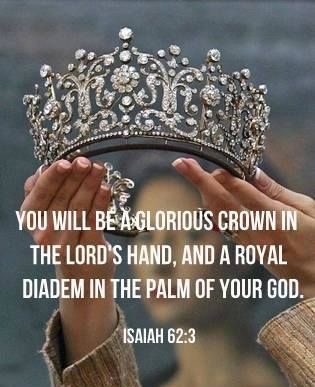 And I think we already know that our God is so very worthy of being crowned with our beautiful unity. Next Post → What Do You Hide Behind?